Evoking the fruitful jazz and pop crossover efforts of the 1970s, pianist Robert Glasper's Experiment infuses improvisational sensibilities into an array of contemporary black music traditions, from R&B and neo-soul to funk and hip-hop. Glasper is no stranger to such collaborations; in addition to leading his own acoustic and electric ensembles, he is music director of Mos Def's touring band and sideman to rapper Q-Tip and R&B singer Maxwell. Drawing from an impressive pool of pop music talent, Black Radio features an all-star cast, including household names like Ledisi, MeShell NdegeOcello and Musiq Soulchild. The majority of the date consists of catchy originals that cater to the strengths of each guest vocalist, yielding a simmering quiet storm-vibeoccasionally punctuated by more distinctive fare. For example, the intriguing duo of Bilal and Lupe Fiasco bring an otherworldly ambience to "Always Shine," which alternates between Bilal's rapturous gospel choruses and Fiasco's metaphysical lyrical flow. Venturing further afield, the bracing title track is one of the album's most enthralling excursions, enlivened by Mos Def's hypnotic wordplay. Unfortunately, the album's slick contemporary production occasionally obscures some of the set's old school charm in a synthesized digital gloss dissimilar to the analog antecedents that inspire it. Unsurprisingly, a handful of well-known covers prove most resilient, key among them being an earthy rendition of "Afro Blue" by Erykah Badu, whose sultry delivery re-imagines Mongo Santamaria's classic as a sinuous jam. Bilal's soulful take on a martial interpretation of David Bowie's "Letter to Hermione" is similarly engaging, but a promisingly experimental variation on Nirvana's "Smells Like Teen Spirit" falters. Glasper's melancholy re-harmonization of the familiar melody is fascinating, as are the fractured rhythms underscoring the arrangement, but the song is ultimately compromised by saxophonist Casey Benjamin's robotic vocoder vocalconceptually appropriate perhaps, but aurally incongruous. Insofar as "the feeling of jazz" is concerned (to quote Duke Ellington), Glasper accompanies each singer with style, but solos only intermittently, enhancing select tunes with prismatic interpolations rich in harmonic variation. Benjamin's processed saxophone tone is only slightly warmer than his vocoder, although his tasteful flute musings are delightful. As the session's MVPs, bassist Derrick Hodge and drummer Chris Dave provide a fresh and unpredictable foundation; atmospheric accents and elastic syncopations keep their post-Dilla beats from falling into the mechanized repetition that hampers much commercial hip-hop. 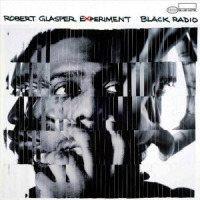 Far from revolutionary, but more adventurous than most pop records produced these days, the boldly futuristic Black Radio suggests that Glasper and like-minded artists of his generation have the potential to restore a jazzy sense of sophistication to mainstream pop music.